Quesadillas have become somewhat of a Mexican American/Tex-Mex classic. The concept of a two tortillas sandwiched together with melted cheese couldn’t be simpler. Unfortunately, this common appetizer isn’t usually as healthy as it is simple. Arguably the most popular versions include a large amount of cheddar cheese, possibly some meat or chicken, and sides of both salsa and sour cream for dipping. Sure it’s delicious but why not take that same concept and make a healthier spring version? That was the idea behind this light and flavorful veggie-packed quesadilla. Goat cheese is one of my favorite types of cheeses. I find its tangy and earthy notes irresistible in the spring and summer. And if there is such a thing as a healthy cheese, goat cheese would qualify. It usually contains almost half the fat of cows milk cheese as well as fewer calories per ounce. When combined with fresh herbs such as chives and parsley, it’s easy to believe your eating something both good for your taste buds as well as for your body (or at least not as bad). By adding a little cream or milk, this delicious herbed goat cheese becomes a spread that is base for the next burst of flavor: roasted veggies. 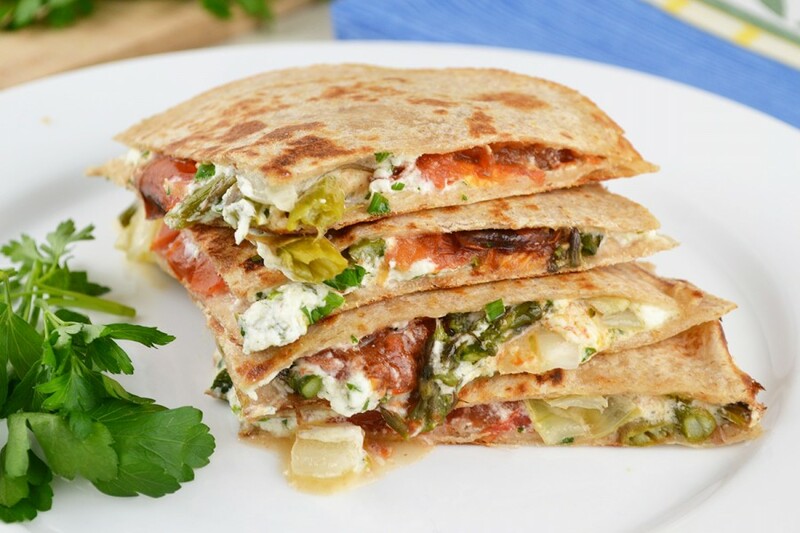 Vegetables are one of the best ways to build on the flavors in this quesadilla. Balsamic vinegar adds a sweetness to the acidic tomatoes while onion provides a caramelized crunch that perfectly pairs with the tender garlic scented asparagus. The veggies are then sandwiched between tortillas spread with the herbed goat cheese and heated until warm and golden. As the juices dribble down your chin from the first bite of this roasted tomato and asparagus quesadilla, you’ll forget that unhealthy classic cheddar version even exists. Grease two baking sheets with olive oil. Arrange tomato halves cut side up on one sheet. Sprinkle with salt and pepper then drizzle with olive oil and balsamic vinegar. Arrange asparagus, onion, and garlic on the second baking sheet in one layer. Drizzle with olive oil, salt, and pepper. Place both baking sheets in preheated oven and bake until asparagus and tomatoes are very tender, about 15-20 minutes. While vegetables bake, combine the goat cheese with the cream or milk. Add chives and parsley. To make the quesadilla, spread on herbed goat cheese evenly on one tortilla. Add a layer of roasted tomato halves, asparagus, and onion. Spread a little more goat cheese on another tortilla and place on top of tortilla with vegetables. Heat a large skillet over medium heat. Add a little oil to grease the skillet. Carefully place quesadilla in the skillet. Cook until golden, about 2-3 minutes. Carefully flip quesadilla and cook until second side is golden brown. Repeat with remaining tortillas and fillings. Ohhh, yum!! I love this spring light, goat cheese and veggie packed Quesadilla! Delicious idea! Goat cheese and asparagus are one of my favorite combinations… but packed between a crunchy tortilla? Yes please!!! Any suggestions as a substitute for the goat cheese? Sorry for the delay. You could use just about any cheese you like. Melting cheese cheddar or mozzarella always work well for quesadillas.